East Dereham towermill was built in 1836 by Michael Hardy, a miller & baker and James Hardy, a millwright. The mill was shown on the O.S. map of 1838 as standing on Cherry Drift, later to become Cherry Lane, just off the Norwich Road. The 42ft five storey red brick tower was 24ft in diameter at the base and topped with a Norfolk boat shaped cap with an iron railed gallery and a 6 bladed fantail. The two pairs of patent sails on an iron windshaft, drove 2 pairs of stones, a flour mill and jumper. A third pair of stones were added later. 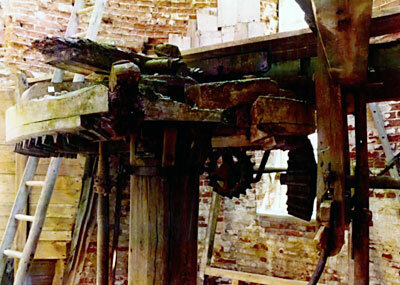 Michael Hardy had been involved with milling for some years by the time he built Dereham mill in 1836. In 1819 he owned and ran Mattishall_Norwich_Rd_smockmill and in 1829 he started to run the newly built Gressenhall smockmill and in 1836 he was also running Ovington old postmill. 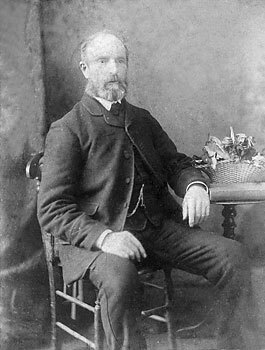 White's 1836: Robert Hambling, Ironfounder, millwright, manufacturer of steam engines, implements and machines for agricultural purposeds, etc. Norwich Road. Tower 42 ft. high, 25 ft diam. At base, 20 ft. inside, wall 2 ft.6ins. thick at base. Brickwork Flemish bond outside, English bond inside. Door to north, window and ladder to west. Drive through east window from paraffin engine (concrete base still in place). All iron bevel wheel on shaft drove iron mortice bevel wheel on stone spindle to one pair of stones on first floor. Wooden block pulley on stone spindle for belt drive governors in window opening. HAMBLING, DEREHAM on cast iron bridge tree, second hand. Dates from 1950/60s. Sack trap opposite door, to south. 1 pair of 4 ft. French burr stones on east side underdriven by paraffin engine. Base of octagonal vat. 8-armed iron mortice great spur wheel on 15 in. square upright shaft. Wheel in two parts bolted together, about 106 ins. overall diameter. 120+ cogs (1 of 8 segments 15-16 cogs) all intact. Original sprattle beams S.E. and S.W. bored for stone spindles at 5 ft. from centre of mill. Later beam to west of door for 3 rd pair of stones. Sites for 3 sets of governors driven off stone spindles. Ceiling beams east to west. Windows north, east and west. 2 pairs of French burr stones underdriven, with 3rd pair added later. This is dressed with 28 master furrows only. Drive through east window from steam engine (1863) and later paraffin engine via outside pulley. Iron shaft with all iron bevel wheel, 20 cogs, to underside of inverted wooden clasp arm crown wheel, about 80 cogs (part rotted away), fixed drive. Crown wheel drove through a similar bevel wheel on south side an iron shaft with 18 ins. diameter wooden pulley for a 4 inch belt to sack hoist. Could be lowered out of gear. On upright shaft above crown wheel a double ratchet and pawl device to allow engine to drive lower part of shaft free from upper section and sails. No further sections of upright shaft. Lower half of wall boarded. 17 ft. iron windshaft, canisters 12 ins. by 15 ins. (length) neck 12 ins. diameter. Wooden clasp arm brake wheel with iron rim and wooden cogs. Probably 4 double-shuttered patents, but no photograph showing them has been found. Composition stone 4 ft. 4 ins. diameter on first floor. To be sold by Auction by Mann & Clarke at the George Inn, East Dereham on Friday 10th June next at 6 o'c. 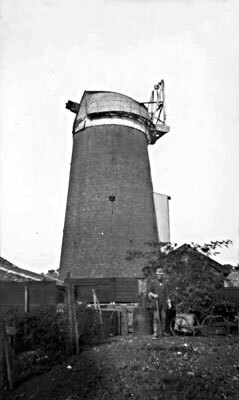 All that newly erected and substantially built Brick Tower windmill eligibly situate within ten minutes walk of the Market Place of East Dereham comprising five floors and driving two pair of stones, with capability of adding a third pair, with patent sails, winding herself, iron shaft, flour mill, jumper, sack tackling and all other necessary machinery on the latest and most improved principles, with stable and cart lodge and about one acre and three quarters of excellent Freehold land adjoining, of all of which Immediate Possession may be had. Apply to Mr Wm. Drake, Solicitor. East Dereham, to Messrs Beckwith and Dye, Solicitors, Norwich, to Mr Michael or James Hardy, the Proprietors on the Premises or to the Auctioneers, East Dereham or at their offices 73 St Stephens Street, Norwich. TOWER WINDMILL To be Let for a term of years. A good new built Brick TOWER WINDMILL driving two pair of Stones, with Flour Mill etc. situate at East Dereham & now in the occupation of the Proprietor, Mr. Michael Hardy. Possession may be had at Midsummer. Apply to Mr. Hardy or to Mr. Goldson, Solr. East Dereham. By auction by Mann & Clarke at the Kings Arms Dereham Thursday 14th December 1837 at 6. o’clock in the afternoon. Sale of newly erected and substantially built brick TOWER windmill eligibly situate near the Turnpike Road leading from Dereham to Norwich and within ten minutes walk of the Market Place of East Dereham. Comprising five floors, driving two pairs of stones, flour mill and damper, with patent sails, winding herself, iron shaft and other requisitine machinery, together with brick and tiled stable and cart lodge and one Acre and Three Roods (more of less) of excellent Land, adjoining, now in the occupation of Mr. John Arms. For further particulars apply to Mr. Wm. Drake, Solicitor, East Dereham, or to the Auctioneers, Saint Michael at Plea, Norfolk. Sale of Capital Smock Mill, Messuage and outbuildings ‘recently erected smock windmill driving two pairs of stones with flour mill and all requisite machinery situate at Beetley near Gressenhall Fairstead and now in the occupation of George Bayfield. All that Freehold newly erected & substantially built brick TOWER WINDMILL eligibly situate near the Turnpike Road leading from Dereham to Norwich within ten minutes walk of the Market Place of East Dereham, comprising Five Floors, driving two pairs of stones, Flour Mill & Dumper (sic), with Patent Sails, winding herself, Iron Shaft & all other requisite machinery together with a brick & tiled Stable & Cart Lodge & One Acre & Three Roods (more or less) of excellent Land adjoining, now in the occupation of Mr. John Arms. Apply to Mr. Wm. Drake, Solr. East Dereham or the Auctioneers, St. Michael at Plea, Norwich. A substantial Brick TOWER_WINDMILL, Dwelling house, Cottage, Stable, Yards and Gardens in the occupation of Mr. Michael Hardy and John Button. The Mill stands remarkably well for wind within equal distances of Wymondham and Hingham, has three floors, Patent Sails, winds herself, dries two pairs of stones, with Flour Mill and Jumpeer and all her going Gears complete and in full Trade. A POST_WINDMILL with two pairs of Stones, Flour Mill and going Gears now in full Trade; a Dwelling house and Outbuildings and about 4 acres of Land of good quality, in the occupation of Mr. William Rose. Mr. Spelman respectively invites the attention of Merchants & Millers to the above valuable Property. The Mills are situate in good Corn districts, within short distances of considerable Market Towns, are surrounded by a large population & present an advantageous opportunity for either Investment or Occupation. Early Possession of the Whole may be had. A SMOCK_WINDMILL with DWELLING-HOUSE, Baking Office, Stable, Garden & piece of Land adjoining, situate at Great Bittering, adjoining the public road & near Gressenhall Fairstead, in the occupation of Mr. John Hannant, whose tenancy expires at Midsummer next. The Mill winds herself, drives 2 pairs of stonmes, with flour mill, jumper & all her going gears complete. The Baking Officce is adapted for carrying on a considerable business & is in full trade. A most substantially-built BRICK TOWER WINDMILL, with 5 floors, patent sails, winding herself, driving 2 pairs of stones, flour mill, jumper and most complete machinery; together with a brick and tiled Stable and Cart lodge and a piece of productive Arable LAND adjoining, containing 1a. 3r. 0p. or thereabouts; most eligibly situated, within a short distance of the town and near the turnpike road, now in full trade, and in the occupation of Mr John Ives, Tenant from year to year. Vendors are Mortgagees with power of Sale. Particulars of Messrs. Goldson, Browne & Carthew, Solrs. Dereham & of Mr. Spelman, St. Giles Street, Norwich. A Man that well understands the Business of a MILLER & a BAKER. A Capital Tower WINDMILL with fixed Steam power attached, Granaries Dwelling house, well situated & accustomed Baking office & several pieces of Land, in a small town in a good wheat district & populous neighborhood in the County of Norfolk. Apply with statement of capital at command to William drake, Esq., Solicitor, East Dereham. Sale of Stock in Trade of James Hardy (who is declining busoiness in consequence of ill health) on Thursday 13 May 1969. WANTED, a steady Man to work a Tower Windmill & make himself general useful. Apply to William Fendick, East Dereham. Auxiliary power (oil engine) in nearby shed drove through iron wheel on horizontal shaft, through horizontal wheel with wooden cogs. Drove two pairs stones on first floor. Iron great spur wheel, tee arm, wooden cogs, attached to wooden upright shaft, square at this point. 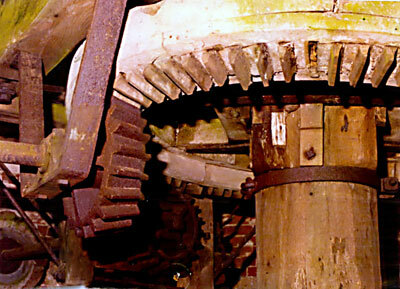 Supplementary wooden wallower with wooden cogs driving two iron stone nuts for auxiliary power above second floor level. Closed for economic reasons. Left complete, but has gradually deteriorated through disregard. 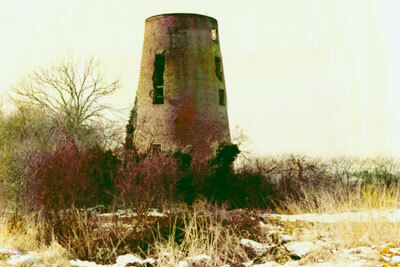 The derelict mill was Grade II listed in 1972 and then bought by Breckland District Council in 1979 with the view of restoring it as a landscape feature over a period of three years. By 1985 the kerb ring had been repaired and the cap and fantail were completed in 1986. New sails were fitted in 1987 and the mill was formally reopened by council chairman J. O. C. Birkbeck, Esq. on 14th September 1987. The area adjacent to the mill was then landscaped with the inclusion of a picnic area and a car park. Dereham Town Council took over the running of the scheme in 2002. Gravestone of Mrs. Sarah Fendick, who died in 1886 aged 68 and whose stone records that her husband, William Fendick (l) was buried in Brompton Cemetary, London. Gravestone of Mrs. Rachel Fendick, who died on 15th October 1936 aged 92, wife of William Fendick (ll) who was born on 2nd August 1841 and died on 12th March 1904. Sarah Fendick, the widow of Wiliam Fendick (l) made a will on 4th April 1870 and appointed her sons Robert and William (ll) as executors. The mill was left to William (ll) and Mill House, which she had purchased from Charles Bennett was left to Robert. 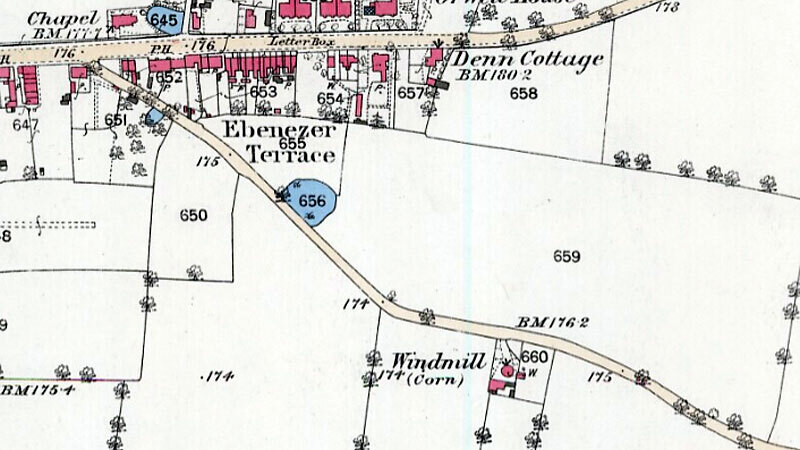 On 25th August 1887, Robert Fendick conveyed Mill House and 3r. 11p of land to William Fendick (ll). It is with sincere regret that we record the death of Mr. Charles Robert Gray, which occurred at his residence in Norwich Street, East Dereham early on Thursday morning. The deceased gentleman, who was in his 59 th year, was the head of the well known firm of corn and coal merchants, which was established by his father, the late Mr. Robert Gray, about half a century ago, with establishments at Dereham, North Elmham and Wendling. Charles Robert Gray was buried in Dereham Cemetery on 6th February 1922. His gravestone gives the date of his death as 1st February (Wednesday) but the Register of Deaths gives the date of his death and its registration as 2nd February 1922. Around the time of the 2nd World War, plans were passed by the Urban District Council to turn the mill into a house. However, these were later turned down by the War Agricultural Committee as chickens were kept on the land round about and there was a lack of proper access. 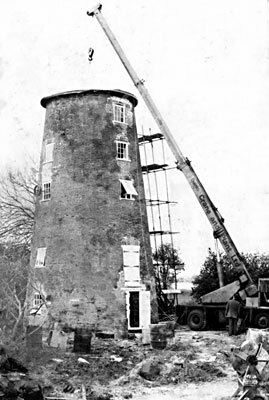 On 6th December 1977, Lennard & Lawn removed the cap frame and windshaft from Dereham towermill and brought the windshaft back to Caston towermill, owned by John Lawn. The windshaft was 17ft long and the canisters 15ins long and 12ins wide. The flanges were at 5ft and 7ft 6ins behind the inside canister, the neck was 12ins in diameter and it was 6ft from the rear flange to the tail flange. Members recently agreed in considering the future of the Dereham Windmill that ‘work necessary to preserve the structure of the Dereham Windmill be carried out but the question of complete restoration be deferred for the time being’. The Recreation & Leisure Services Officer reports that since its renovation under the Manpower Services scheme three years ago, a number of requests have been received from voluntary groups to use the mill as a meeting place etc., but as yet these have not been conceded to because of the uncertainty over its future management. A request has recently been received from the ‘Central Division Norfolk Girl Guides’ to tend the mill by keeping it tidy etc. and using it as a meeting place during the summer months. In view of this latest request and other groups that it is known are interested, members are asked whether they would wish to pursue the principle of such use by voluntary groups. If members are agreeable to this proposal, it is suggested that a general meeting beheld of those groups who have expressed an interest in the past. The Recreation & Leisure Services Officer reports that a meeting has taken place at which representatives of the Central Division Norfolk girl Guides, Toc H, Society of Friends and Mid-Norfolk Scouts were in attendance. The Chairman of the Council was also present. It had become apparent that some organisations were under the impression that services were available and, once the reality of the situation had been explained, only the Toc H and Girl Guides retained their interest. The Recreation & Leisure Services Officer has established that any use would be throughout the summer months only and on no more than a weekly basis. At this stage details of usage are unavailable although this would involve keeping the windmill clean and tidy as well as using it as a meeting place. Insurance and legal aspects are being examined, but would appear to present no problems. Formal leases are not expected to be necessary and conditions of use will make it clear that the Council would have no liability in the event of accident or claims by the user. If the Committee accepts the principle of the use, the Toc H and Girl Guides will be given permission to make use of the windmill, both groups liaising as necessary over time-taking etc. The Committee’s instructions are requested. On a warm summer evening a considerably lower temperature would probably be noticeable in the windmill!! Voluntary groups are to be allowed to use Dereham windmill:- Breckland council planners have decided, and a meeting is to be called for all those interested. An offer by Norfolk Guides to help keep it tidy in return for using it has been accepted. Mr. J.D. 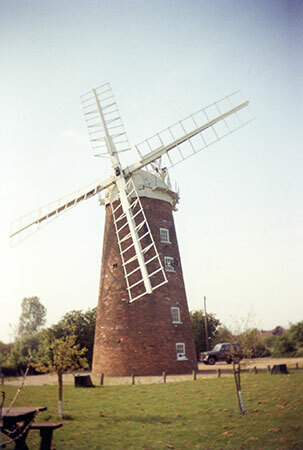 Johnson reported that a considerable amount of vandalism had occurred to the Dereham Windmill which undid much of the good repair work carried out by the Council. He stated that as many as 30 window panes had been broken and asked whether funds were available to repair the damage. The Chief Planning Officer advised the Committee that the Surveyor had a scheme already in hand and that discussions were also taking place with Norfolk County Council with a view to the eventual complete restoration to working use of the windmill. A report on the matter would be available for consideration at the next meeting. Resolved that consideration of this matter be deferred to the next meeting. 336/84 Dereham Windmill Agenda item 8. 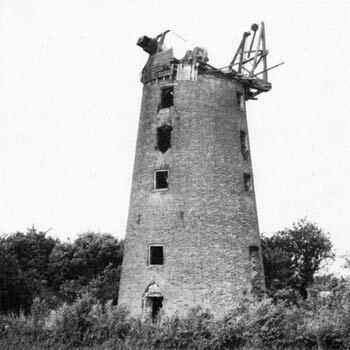 The Committee felt unable to approve a complete restoration project for the windmill at the present time in view of the high costs which were likely to be involved. However, it was considered that if the windmill could be provided with electricity and other services, it might be possible to bring it into greater use and thus substantially reduce the likelihood of its being vandalised. repair works be carried out to the windmill to make it watertight, replace the glass to the windows and fix new locks to the doors, the cost to be met from the Conservation fund. The Chief Planning Officer investigate the possibility of providing electricity and other services to the windmill and report back to a future meeting. At the 12 th November meeting of the Committee it was agreed that immediate repairs should be carried out to make the Mill watertight, to repair the windows and doors; the cost to be met from the Conservation fund. Notwithstanding that the Committee felt unable to agree to the cost of full restoration at the present time, the M.S.C. has agreed to undertake the repair work and work has already commenced to make the roof watertight. The R.L.S.O. * has been informed that as the tower is likely to be scaffolded for several months and the dangerous condition of some machinery, the mill should be closed to all members of the public until further notice. The Committee also requested an investigation into the cost of providing services to the site. A year ago, Eastern Electricity Board estimated the cost of providing electricity to be approximately £1100. Mains water can be laid on along Cherry Drift by the M.S.C. team at relatively little cost for materials and the Water Authority’s connection fee. It would be of greater immediate benefit to the M.S.C. team to have the water laid on first. Although the Committee has decided for the time being, against expenditure on full restoration, the Council is committed to this ultimate aim by the terms of the original purchase agreement. It is essential therefore to obtain a detailed schedule of works and costings from a millwright at some stage. Mr. Lawn, the Caston millwright, has estimated his fee would be approximately £250 to produce such a report during the next few months. For proposed Report on the mill by the Chief Planning Officer which was not considered. New Report on the Mill by Chief Planning Officer with John Lawn’s costs for restoring mill as a landscape feature, with or without Manpower Services Commission. Cost over 3 years £25,000. with MSC. Additional expenditure of £2000 be approved from the Conservation fund to provide water and electricity to the site. The services of Mr. Lawn be engaged to prepare a detailed schedule of works including working drawings and costs and that his fee of £250 be met from the Conservation fund. New curb ereccted. Other work completed included new windows and repairs to brickwork and floors. New cap and fantail erected. New steel stocks on site. 40 otherwise unemployed workers have been involved. Socks & sails, brakewheel & brake and fangears erected. Official opening of mill by Mr. J. O. C. Birkbeck, Chairman of Breckland District Council. Dereham windmill is to remain locked in a bid to prevent vandalism. 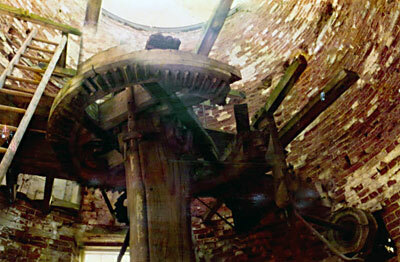 The 19th century cornmill used to open in summer months on Saturdays, Sundays and Bank Holidays. The mill was unlocked in the morning and left unsupervised during the day. Fears were expressed about possible vandalism and people injuring themselves - especially young children trying to climb to the cap. New members of Breckland District Council's recreation and tourism committee have decided to keep the windmill- which the council bought for just £1 in 1979 - under lock and key until someone can be found to open the mill on Sunday afternoons and remain there. Frank Davidson, industrial development and tourism officer said: "We cannot risk opening the mill without supervision. I would like it to be open more but we cannot afford it." Mr Davidson said he was also initiating talks with national conservation bodies such as English Heritage and the Norfolk Windmills Trust to see if they were interested in helping with the management of the Grade ll listed building. "It is very early days yet," he said. "We're keeping all options open - it is possible that they would take overall control but nothing is yet certain." 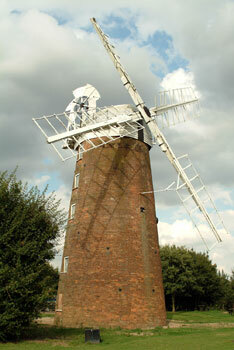 DEREHAM windmill is facing a make-or-break opportunity for restoration after storm damage to one of its sails. The historic windmill, which has been the focus of a campaign to restore it to full working order, lost half of one of its wooden sails in high winds on Tuesday morning. The windmill was cordoned off early last week after a small piece of wood fell off. Dereham Town Council clerk Pat Jarrett, who went out immediately to inspect the damage, said she hoped that the insurance would cover it. 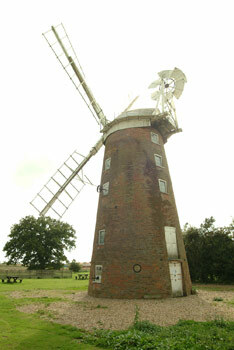 Geoff Hayton, of the Friends of Dereham Windmill, said that any insurance money could be a lifeline for the windmill. He is confident of gaining Lottery Heritage funding for around 90 per cent of the estimated £600,000 cost of restoration to full working order, and hopes that the insurance money for repairing the sail could provide the other 10 per cent. The Friends of the windmill have been waiting for the town council to decide what they want to do with the historic mill. Any bid to restore the windmill would need their backing, not least because funds would need to be raised. Mr Hayton said: "The ball is in the council's court. We cannot go any further until the council says whether it wants to go down our road, or let it disintegrate further, or hand it over to the National Trust or English Heritage. Mrs Jarrett said: "The council has received the report from the millwrights and will be discussing it in detail at the next meeting." Councillors were told of the damage to the mill at their meeting on Tuesday night. Deputy mayor June Barnes said: "Council staff have moved debris and cordoned off the area. We would ask people to keep away from the area until further advice has been sought." I am writing from Australia and have been looking into my Family history for sometime and recently discovered that my Great Great Grandfather owned East Dereham Towermill, his name was Michael Hardy and his son was Michael Hardy as well. 2008: Mill open for public viewing to the exterior only. A project to restore Dereham's historic 19th windmill, to make it one of the town's biggest tourist attraction, looks set to be mothballed because of a lack of funding. The Grade II listed structure in Penny Lane has had a chequered and colourful history, but now it seems that after years of lobbying for funding by the mill's trustees, they have resigned themselves to it just being made structurally safe and left boarded up. Trustee chairman and mill restoration campaigner Geoff Hayton said it looked as if they have come to the end of the road because repeated attempts to secure funding to carry out complete restoration of the red-brick 42-feet high mill had failed. He said: “For just £400,000 the Dereham windmill could have been preserved for posterity, but our efforts to secure funding have continually hit a brick wall. The trustees feel so frustrated and it looks like they will be wound up as a body,” said Mr Hayton. Last year, the EDP reported how a bid to the Heritage Lottery Fund for £338,000 had been turned down over fears of the long-term sustainability of a new visitor attraction in the area - a claim refuted by Mr Hayton. He added that there was to a meeting next week at which it is likely Norfolk County Council will agree a small amount of cash for essential repairs to make the structure safe and watertight. He strongly believed that had £400,000 been spent to restore the mill, it could have paid its way and been further developed using income from admission prices and a tea room facility. “The restored mill could then have become part of a tour of Dereham setting out from the Mid-Norfolk Railway and other tourist “hot-spots” could have included been Gressenhall Farm and Workhouse and historic Bishop Bonner's Cottage in the town centre. The windmill was built in 1836 by Michael Hardy, a miller and baker and James Hardy, a millwright. The 42-feet high five-storey red-brick tower was topped with a boat-shaped cap and fantail sails. It was restored by Breckland Council and The Manpower Services Commission under the supervision of millwright John Lawn. It was opened by the then chairman of Breckland Council, John Birkbeck, on September 14, 1987. 1909: Mill sold to Charles Robert Gray & Arthur James Milk for £450.00. 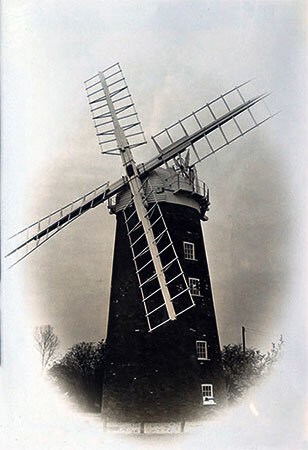 1926: William Robert Gray, Arthur Payne Milk & Henry Jonas Harding Garlick trading as Robert Gray Ltd.
2003: Friends of Dereham Windmill commissioned a full survey of the mill by millwright Tom Davies. October 2011: New Board of Trustees formed that was successful in raising funds.